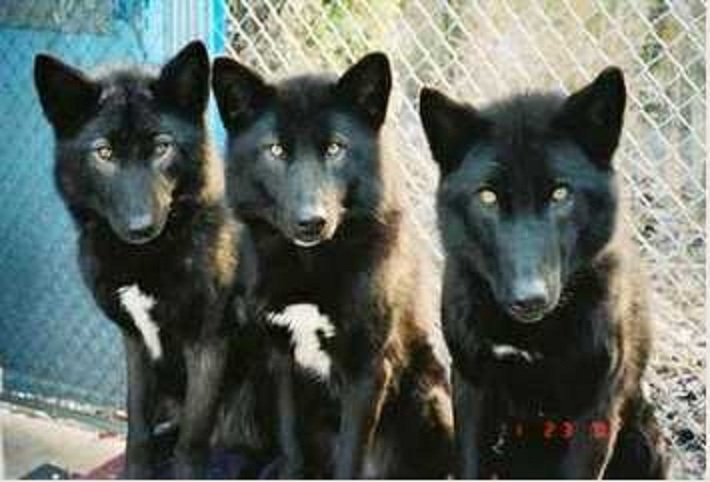 What are these black canids? I know the answer so I won’t say, but I am all excited about this! Oh! You gave it away! Well, I hope the word spreads. I love mixed breeds bred to get looks and temperament out of a sound type. These guys are very consistent, though I have a high tolerance for variety as long as the general dogwolf type is activated without resorting to fresh wolf influx..
A type like this one, if you like the large ones, and a “techichi” or deer type for the small ones. And one that bridges the two in size, as,dogs will come in all sizes. These are worthy dog breeding projects for the 21st century. And not that hard to keep a high level of heterogeneity. I know that the deer chihuahua or techichi type dog can handle just about any outcross, then if bred back to type in the next couple generations, the type is easily restored. I am actually writing a post on the fact the we need to think about how to breed dogs for health and temperament in these days of 2% kill rates. We need to produce local dogs and not import akc eligible dogs from Mexico! When one is breeding for dogwolf type and temperament, one is essentially burying most of the recessives, most of the time. It is easier to restore type toward the dogwolf than away from it! when you need two recessives to keep the type you want. Seriously, shows what a knowledgeable and dedicated person can do in 20 years. Quite amazing. Those three particular ones all have a border collie eye, don’t they? These guys come in all colors and are actors. They play wolf parts so they don’t have to use wolves. It looks like they think moving toward AKC is good. Hmm. I hope they keep it very heterogeneous and add new stock every generation, avoid the stud effect, and generally work toward this basic dogwolf archetype without ever adding any new wolf, at least until we start getting lines of friendly unfearful wolves. if that is ever possible given attitudes, etc. I doubt that, so going with these artful mixes is the wave of the dog-breeding future- IMHO, LOL!. Must admit that look like just what is needed in collie outcrossing. This comment likely would send collie show breeders into orbit. .It seems the last all black collie was at least bred 15 years ago. A war developed in their registration but AKC did register them as pure bred? So following the history of the breed where the black and white is recorded a way to bring it back. This is exciting. Laughing out loud those yellow eyes that breeders found offensive so many years ago. Here they are again. One might say that a wolf would have excellent night vision? Reblogged this on Mystery of My Hairless Chihuahua. Wait just what ARE they? I’m ok with new breeds and with some sort of open registry /appendix registry system to reduce COI and address some breed specific genetic issues. But I think it is very misleading to assume that just mixing is going to ultimately reduce or eliminate problems without ever introducing them. It’s like anything else — the result depends on the quality of the initial ingredients.